Posted in From my diaryTagged Hagiography, Santa Claus, St George, St Nicholas of Myra3 Comments on Help at last! A FREE database with all the references to the Saints and their cult before 700 AD! Another of the medieval “saints’ lives” of St Nicholas of Myra, the basis for our Santa Claus, is now accessible in English. This is the so-called Vita Compilata, or “Compiled life”, put together from earlier hagiographical sources. A kind gentleman writing as Fr. Alban Justinus has translated it for us, from the Greek edition of G. Anrich. Many thanks! As ever, these are made public domain. Do whatever you like with them, personal, educational or commercial. Writing lives of the saints was something that everybody did in the Greek empire from 400 to about 1000. After that people stopped writing new lives, or not in the same way. But up to that point these lives were written by people of all stations. The forms of Greek used reflect that ordinary people wrote them. It was genuinely a popular form of fiction. During the reign of Constantine VII Porpyrogenitus (d. 959), the emperor ordered the creation of all sorts of compilations. Whether by coincidence or not, soon afterwards we find the creation of a compilation of earlier saints’ lives, revised and with the style made acceptable. This compilation takes the form of a menologion (see my prior post for this), and it is ascribed in the manuscripts to a certain Symeon Metaphrastes, or Symeon the Compiler. This compilation became the standard collection of the lives, and the form of each life that Metaphrastes gave it likewise becomes the basis for the future. It’s like the King James Bible, or the Vulgate; it marks a conclusion and a break with the past. Among the saints included was Nicholas of Myra, whose lives we have been translating for a while now. It really is not that clear who Metaphrastes was, or exactly when he lived. But around a century later Michael Psellus wrote an encomium on him. This has recently been edited by Elizabeth A. Fisher in the Teubner series of Psellus in the Orationes Hagiographicae. But I find that she has also made a translation into English of the Encomium for Symeon Metaphrastes, and that a version of it is even online here and more specifically here (although you may need to search; the links move around). This is marvellous news! Leaving aside the florid compliments, let’s extract what Psellus says about what Metaphrastes did, to produce the “final version” of the life of St Nicholas (and others). 3.6. Symeon … did not adopt a different style of dress, nor compromise in any way his truly noble spirit, nor embarrass his family with any sort of silly novelties, nor offer a model of political subjects only to remodel it, nor otherwise play the part of a disreputable sophist. Instead he employed his hereditary affection for honorable conduct as most useful raw material for accomplishing what is good and straightaway took the excellence derived from his studies as the basis both for true nobility of spirit and for brilliance. For as a special favorite of the emperors he was entrusted with the most honored assignments of all; Symeon received a position close to the imperial throne because of his keen intelligence and, due to his natural aptitude, also held an administrative post in government supervising public affairs. He initially (275) received an appointment to the imperial chancery, privy to confidential resolutions and working with imperial advisors. When his trustworthy character in these duties made him well known, he undertook responsibilities in external affairs in addition to his duties in the palace, with the result that it was he who conveyed to the emperor messages from outsiders and relayed imperial communications to outsiders as well. He was, so to speak, the administration’s precise communications link. 3.7. … Symeon was himself wholly attentive both to the emperor and to public affairs. … He was able to drive the barbarians farther from the territory belonging to the heirs of the Roman Empire, to prevail against them either through military expeditions or by means of artifice, to bring other countries into subjection, and to adopt a ready stance regarding requirements of the moment for the matter at hand. 3.9. …. some had no patience for reading the annals [of the martyrs] because they were so crudely written, while others considered the accounts objects of derision. Their awkward composition, incoherence of thought, and mediocre style were harsh to the ear and repulsed rather than attracted an audience. Because of the authors who wrote about them, we habitually satirized the marvelous struggles and monumental victories of the servants of Christ. Although everyone complained loudly about the situation, those who had the ability to replace these writings with better ones lacked the will to do it, and those who had the will lacked the ability—some because of timidity of spirit, others because the enterprise was all engrossing, and one man’s lifetime would not be sufficient for it all. 3.14. People do indeed say that Symeon did not undertake the project as a hobby nor simply set it for himself, except to the extent that he was willing to do it. However, fervent appeals from the emperor moved him to undertake this project as well as appeals from those who valued intelligent discourse. He had his preparations ready at hand and had a team of considerable size composed both of those who initially took down his dictation stenographically and of those who subsequently transcribed it in full; each group worked in support of the other, one producing an initial text, the other a second draft. 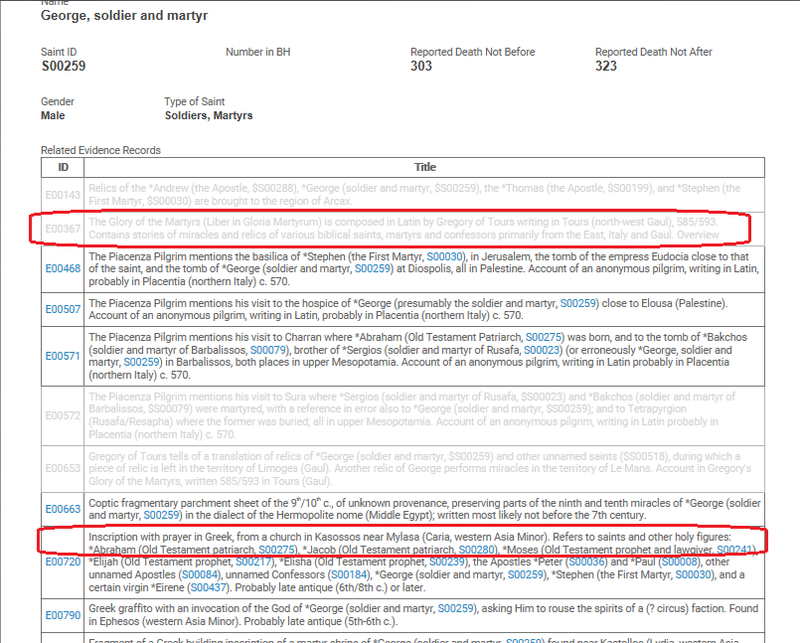 After them, the final redactors went over the written texts to compare them against the content intended by Symeon and to correct whatever error might have escaped the notice of those who drafted the texts, because Symeon could not possibly review the same works repeatedly himself due to their great number. We can draw a number of conclusions from this. First, the lives of the saints were not considered particularly reputable by the highest literary circles. The style was such as to provoke satire. In fact even after Metaphrastes’ work, the lives were not on the same level as the Greek classics. But at least they were not an embarassment. The style was improved, the material paraphrased (or metaphrased) to produce something readable. If I can get a translation made of Metaphrastes’ life of St Nicholas, it will be interesting to see how this reflects the earlier materials. There are various medieval lives of St Nicholas of Myra. The Greek texts were collected by G. Anrich in Hagios Nikolaos, which is still useful today. One of the sections of this book (section VIII) is devoted to “Synaxarientexte” – texts from various types of synaxarion. I placed online a translation of this material a few days ago. But I found myself in difficulty. Like most people, the word “synaxarion” does not mean anything to me. I also ran across terms for similar-sounding material, all equally baffling – “menologion”, and “menaion”. This was rather confusing. In fact there is a short article on these three terms in the Analecta Bollandiana, by Jacques Noret, although I have no access to it (if you do, I’d be glad of a copy), in which he frankly admits that the Byzantines themselves used the words interchangeably! What I am interested in are the Lives (=Vitae) of the Saints, and specifically those of St Nicholas of Myra. That’s quite clear. But does it survive contact with the definitions for the other two? Menaion (μηναῖον, from μήν, “month”), a set of 12 liturgical books, one for each month, containing the variable hymns and other texts (lections, synaxarion notices, kanones) proper to vespers and orthros of each feast of the fixed cycle, that is, those feasts that fall on a fixed date in the church calendar. Although the cycle of feasts itself had been established since the 10th C., …, the first systematic menaia with hymnography for each day of the year appear only in MSS of the 11th-12th C. ..
Synaxarion (συναχάριον), a church calendar of fixed feasts with the appropriate lections indicated for each one, but no further text. The synaxarion is often appended to a Praxapostolos or Evangelion. It is rarely illustrated, but one MS., Vat. gr. 1156 of the 11th C, has an image of a saint for each day from Sept. through Jan. as well as scattered ones thereafter (Lazarev, Storia, fig.205). There also exist “calendar” icons, with portraits of saints and feasts for each day of the year (Soteriou, Eikones, figs. 126-35), that must be based on this type of synaxarion. The term synaxarion is also used in Byz. Greek for a specific collection of brief notices, mostly hagiographical: the Synaxarion of Constantinople. The Synaxarion of Constantinople was probably formed in the 10th C. (the earliest MSS already include notices on Joseph the Hymnographer and on Patr. Anthony II Kauleas (895-901), and there are Arabic, Georgian, Syriac, and Ethiopic versions. These daily commemorations, which average only about a paragraph in length, stress the martyrdom of the saints and inform us where in the city the commemoration took place. The Menologion of Basil II is, despite its name, an illustrated version of this type of text, as are those icons and frescoes that have images of the martyrdoms of the saints, rather than just their portraits (see Hagiographical Illustration). Some of the frescoes use verses from the metrical calendar of Christopher of Mytilene as captions; these verses had been incorporated into certain recensions of the Synaxarion of Constantinople from the 12th C.
Synaxarion = a calendar of saints’ feast days, in calendar order, with the bible readings for the day. The Synaxarion of Constantinople is a collection of one-paragraph saints’ lives in the same order. Menologion = a collection of long saints’ lives in the same order. Menaion = a 12-book collection, one per month, of the bible readings, hymns, synaxarion entries, etc, for the feast day of each saint, in calendar order. Nice to have that clear! So the St Nicholas stuff in Anrich section VIII is from the synaxarion, and its brevity makes that plain. The long life of St Nicholas by Symeon Metaphrastes is from the Menologion compiled by Metaphrastes. All this stuff is unfamiliar to me, but if we must work with hagiographical texts, at least we can get clear on this bit. Christmas is coming, and, as it happens, I have a new translation for you. This is another piece of the medieval St Nicholas of Myra material, all edited by G. Anrich in Hagios Nikolaos back in 1902. In the Greek orthodox church, various days are marked as saints’ days, and a short life of the saint is included in the church service for that day. These materials for each saints’ day are included in a 12-volume collection known as the Menaion, or the Synaxarium. There are two versions of the Life of St Nicholas in the manuscripts, a longer one and a shorter one (itself in two versions). Anrich printed them all as section VIII of his book. These are translated below. These were translated by Fr Albert Iustinos. This is the pen-name of a monk on Mount Athos. I think that he has done a splendid job, and I am looking forward to a translation of the Vita Compilata (Anrich section IX) in due course. Thank you very much! As ever, these are public domain. Do whatever you like with them, personal, educational or commercial. The tomb of St Nicholas of Myra? 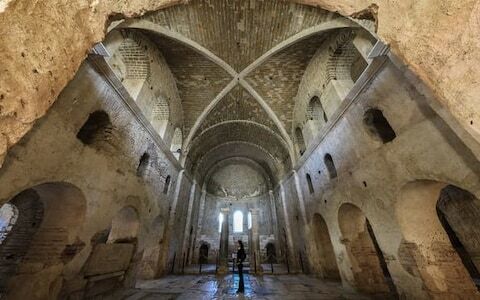 Turkish archaeologists have used ground-penetrating equipment and discovered the shrine of St Nicholas of Myra underneath the church of St Nicholas in Demre, ancient Myra, according to the Daily Telegraph. The report seems rather sketchy, and the claims likewise. They are also claiming that the bones of St Nicholas, supposed now to be in Bari, have in fact remained in Demre/Myra, although it is hard to see how any electronic equipment could tell that. But of course the Turks are hoping for a boost to the tourist trade, and understandably so. Let us wish them good luck in their excavations! Church of St Nicholas of Myra in modern Demre, ancient Myra, in Turkey. Posted in From my diaryTagged Nicholas of Myra, St Nicholas of Myra1 Comment on The tomb of St Nicholas of Myra? As usual I make these public domain – use them for any purpose, personal, educational or commercial. It’s translated from the Greek text published by G. Anrich. Apparently there are quite a number of late encomia which merely retread the earlier material, and this is mostly one of them. Still useful to have, tho! UPDATE: Dr. E. has drawn my attention to an editorial error with note 14. I’ve uploaded new versions of the files. A challenge for Greek language nerds! What do you make of *this*?! One of the texts for St Nicholas of Myra is a beast and a monster. No matter how good your Greek is, it is bafflingly hard. Part of the problem is that it is written in a poetic style – the editor, Anrich, even marks the cadences with <> marks! The opening section is highly rhetorical and windy; even the narrative portion, telling the tale of the three virgins for whom Nicholas found dowries, is difficult. Anyway, speed of work on this was about twice as slow as on the previous ones, even with leaving seven places where I have had to take a guess from the context at meanings which were out of my reach. I suggest that, as it’s only for your blog, you could put this bit up, complete with my notes about those seven places, and invite anyone who knows more to contribute their solutions. And here is David’s final version of the translation, after much discussion in the comments. Any further comments are very welcome! I’ve reached, in rough, halfway through para.2 (“Heimat”) – far enough to try a bit of it out on you, to see if it really is the sort of stuff you want. Note first that, as the bit of Greek embedded in Anrich’s introduction reveals, it is designed as a poem (ποιημα). The angle brackets that disfigure the text passim are the cadences, marked by Anrich in accordance with Meyer’s Sentence-end Law (intro. para.2), and therefore, I suggest, nothing whatever to do with us, even if I could reproduce them. The whole of the first paragraph is the sort of wordy grovelling that you see in the preface of 17th/18th cent. English treatises, designed to flatter the dedicatee; it expresses the author’s intention to please him by giving up writing encomia, and writing narrative instead. It all sounds very, um, Byzantine! Posted in From my diaryTagged Methodius ad Theodorum, Santa Claus, St Nicholas of Myra42 Comments on A challenge for Greek language nerds! What do you make of *this*? !